Semyon Varlamov took to the ice this morning sporting a sharp-looking freshly painted goalie mask. You know, that one he purchased way back in January and wore in a rehab-stint with Hershey right before the Olympics. Well it appears Varly’s finally breaking it in for good this time for the upcoming season [Ed Note: Nope, bad assumption]. Since I was at Kettler I decided to take a few photos the of the red mask which is a majority Capitals-themed, in contrast with his mask last year which was split between the Caps and Russian halves. 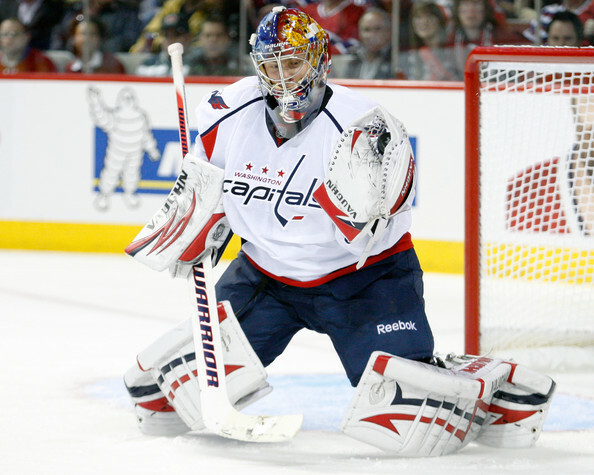 The mask features Varly’s nickname on the chin with American and Russian flags, airbrushed eagles (single on the right and double on the left) and the word “Capitals” on the sides, a beautiful Weagle surrounded by red stars on a white background on the top, and a solid red back with several white stars. Follow us past the jump for some more photos. Click on the photos for bigger versions. Enjoy!